The bees are out and looking for flowers. All we have for them so far is a small patch of crocuses. I think I better plant several hundred crocuses this fall. They're so exciting for us as well as the bees. Here are two soaps that are relatively new. 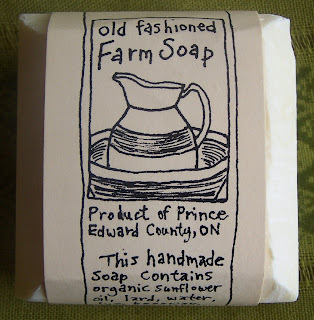 The Old Fashioned Farm soap is made from fat that we rendered into lard. We wanted to make a local soap since usually our soap is made from olive oil from Italy and coconut and palm oils from the Caribbean. So, we used fat from John Nyman in Prince Edward County, organic sunflower oil from Quebec and beeswax from our bees. We scented it with rosemary essential oil just in case it smelled like meat - it didn't. Once the soap had cured the smell was just.... soapy. We're really happy with the way this soap turned out. The bar is hard and lasts a long time. It's very soft on the skin and lathers nicely. 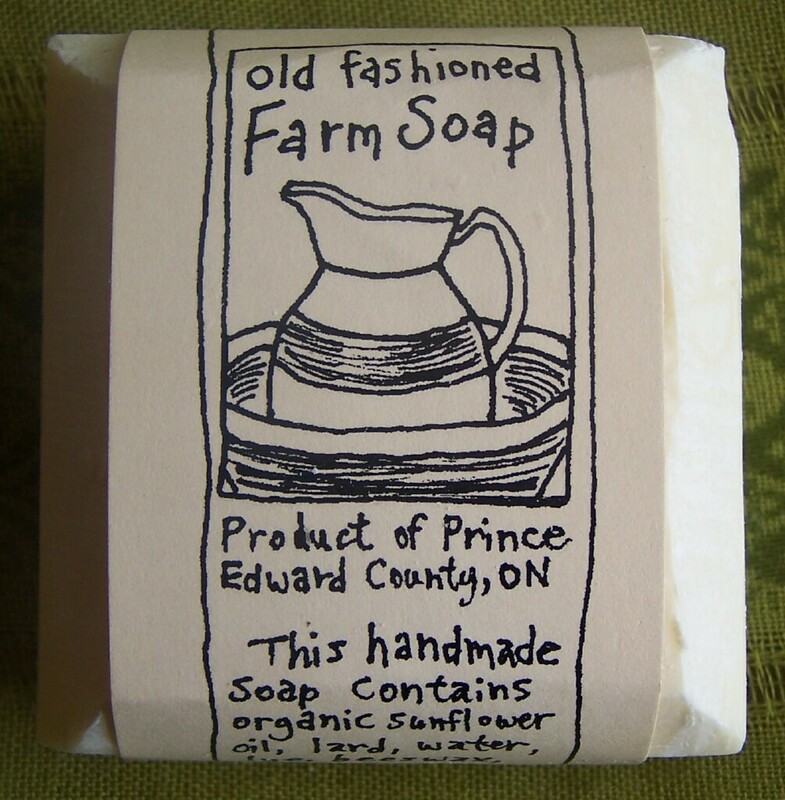 Since the price of imported oils is rising rapidly we may start making more variations on this local bar of soap. I want to try rendering the fat over a fire this summer since it does smell up the house quite a bit. The Beer Bar is a project that has been in the works for a long time. 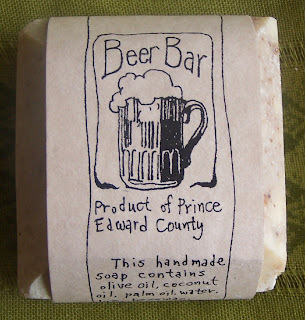 Our friends over at Brewers Crap have been bugging us to make a soap for them to sell for a long time. They sell nifty products made from the waste from brewing beer. This includes using the grain sacks to sew beer different kinds of bags. 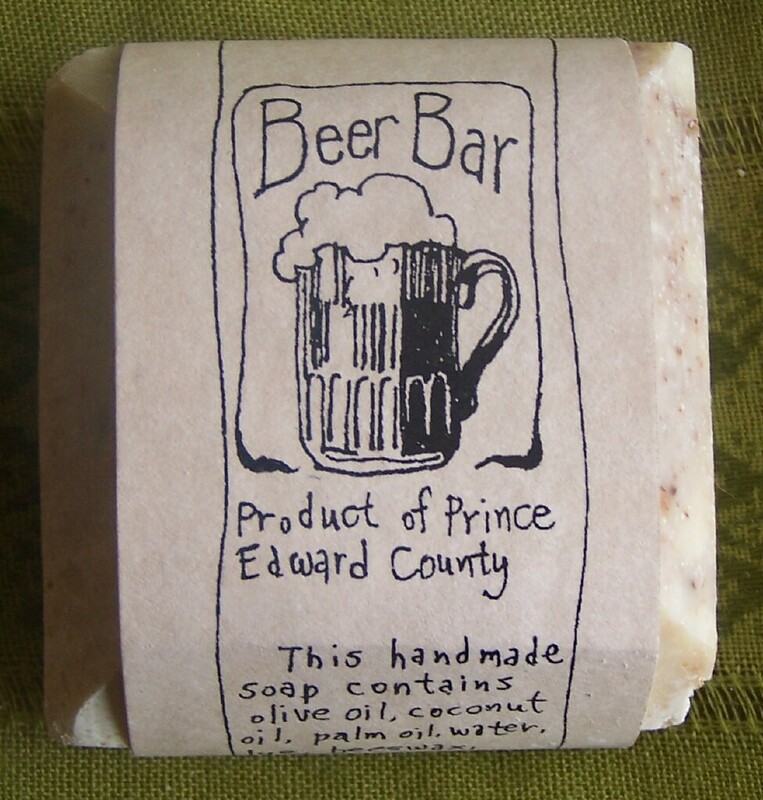 This soap contains the spent mash from brewing beer, a bottle of beer, hops that we grow, and honey! It's scented with a blend of ginger, orange, bay and fir. It's another 'manly' soap. Both of these soaps are available on our website honeypie.ca. Also, we're madly cleaning our house to prepare for the Green Homes Tour. It's April 10th and is organized by the County Sustainability Group. We built our straw bale home from 2004-2006. We moved into our house in December of 2006 just in time for the arrival of our daughter Hazel. We've been delighted with the warmth of our house in the winter and it stays nice and cool in the summer. It was a completely new experience for us building a house but we're very happy with the way it turned out. We will have a slide show of photos of the building process during the tour and can answer all kinds of questions about the house. Today I am happy to introduce our long awaited herbal tea for kids - Tea Party! It's a delicious and nutritious blend of sumac, red clover and elder flowers. The tea has a beautiful red colour and a fruity flowery flavour. 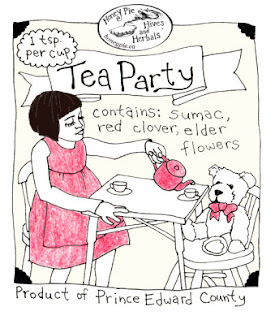 As promised I'm posting the photo of Hazel's tea party with the bear and the drawing I did from the photo for our label. It will be available for sale on the website this afternoon. This weekend we'll be at the Seedy Saturday in Ottawa with our wares for sale and we'll be giving out samples of Tea Party tea. We had a great time at Seedy Saturday in Picton last week. We didn't have our table set up but went for fun and got some great seeds - some from the swap table and some we bought. I took lettuce seeds I had saved as well as coriander and nigella. My honey man has been working on a project to turn an old Victrola cabinet into a honey liquidizer. When we have honey that crystallizes in the bucket we have to warm it gently in order to make it pourable so we can bottle it. We don't want to heat it too much or that destroys the beneficial properties of the honey. We had been putting the buckets into a sink of hot water but our well has been dry since July and we have to buy water to fill the cistern so this seemed like a waste of water. So, my honey man came up with this ingenious plan to insulate the victrola cabinet and put a light bulb in the bottom. We use a thermometer to monitor the temperature and a dimmer switch to control it. I am happy to say, after a minimal amount of head scratching - it works!